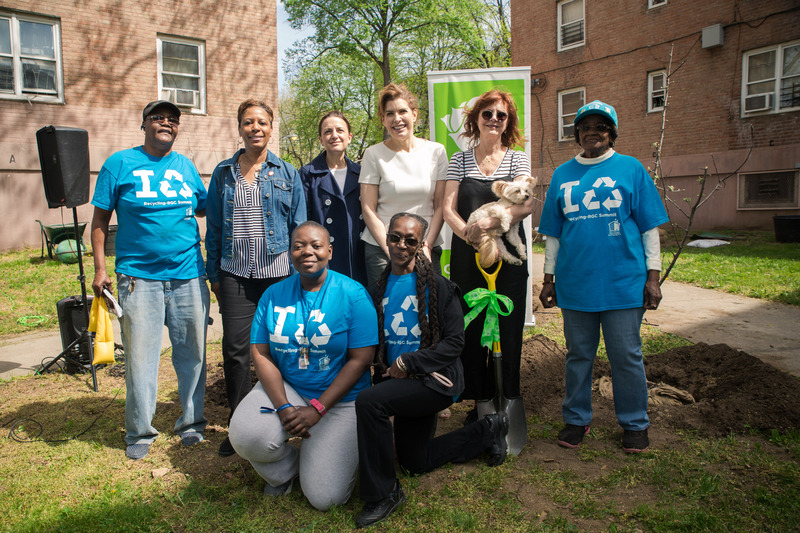 On Saturday, May 5th, Capalino+Company client New York Restoration Project (NYRP) joined actor Susan Sarandon, Council Member Adrienne Adams, and NYC Film Green to plant an orchard of 20 fruit trees (including apple, pear, and fig) at New York City Housing Authority’s South Jamaica Houses in Queens. 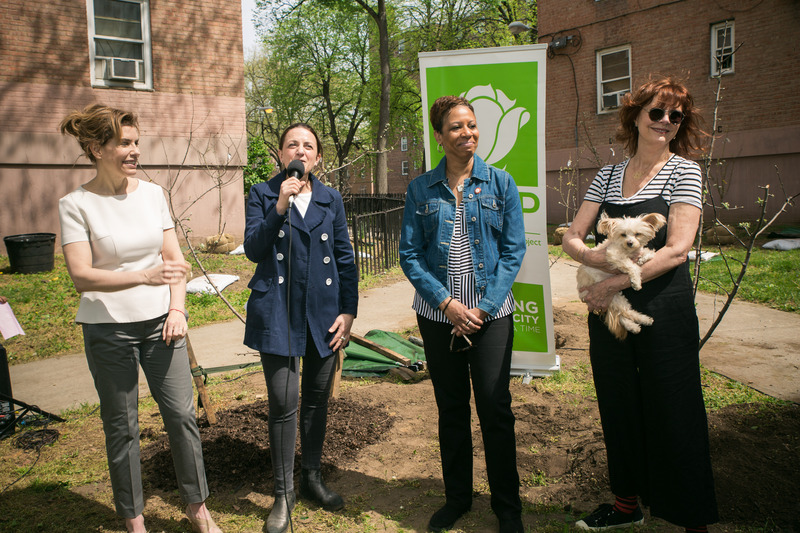 The groundbreaking and tree planting event included remarks by Sarandon, Council Member Adams, Commissioner for the Mayor’s Office of Media & Entertainment Julie Menin, NYRP’s Executive Director Deborah Marton, NYCHA leadership, and South Jamaica Houses residents. “I wanted to find an opportunity for the TV and Film Industry to give back to a city that has given so much to us,” said Sarandon. “What better way to help offset our carbon footprint than trees? And for a community to have their own fruit trees is so beautiful,” she said. Sarandon was inspired by NYC Film Green’s efforts to create a culture of sustainable production on film and television sets throughout New York City. The idea was a natural fit for the NYC Film Green program, an initiative of the Mayor’s Office of Media and Entertainment, that is setting the gold standard for best practices in sustainable film and television production. Through Film Green, eco-friendly productions are working to track sustainable practices, reduce their environmental impact, and create a culture of sustainable production. “When Susan came to us with the idea to plant fruit trees around the city we were absolutely thrilled. Reaching out to NYRP was the logical next step,” said Menin. “Trees are beneficial in thousands of ways, and I’m grateful for the opportunity to work with Susan, the Mayor’s office, NYCHA and South Jamaica’s Resident Green Committee on a project that shows how trees help grow communities,” said Marton. In keeping with NYRP’s belief that nature is a right of every New Yorker, this project is among hundreds of new or renovated green spaces created by NYRP across all five boroughs. Sideya Sherman, NYCHA’s Executive Vice President for Community Engagement and Partnerships expressed her appreciation to all the partners for supporting the project, which she said will not only complement South Jamaica Houses’ successful urban farm, but also promote greener and more sustainable communities across NYCHA. NYRP believes nature is a fundamental right of every New Yorker, and works to manifest that right by partnering with local communities, public agencies, and the private sector on a daily basis. In 2015, NYRP helped NYCHA’s South Jamaica Houses transform a small garden into a large and vibrant community space through the Gardens for the City program, which lends materials, labor and other types of support to neighborhoods throughout the city. Currently, residents grow tomatoes, sweet potatoes, zucchini, thyme, basil and other fruits, vegetables, and plants. Donors to the Film and Television Orchard include Sarandon, Bette Midler, Ryan Murphy, SHOWTIME Networks, NBC Entertainment, Ben Stiller, Edward Norton, Naomi Watts, Jimmy and Nancy Fallon, and Whoopie Goldberg, among others. For more information, go to www.nyrp.or/filmandtelevisionorchard. To learn about Capalino+Company’s Nonprofit Advisory or Corporate Social Responsibility Services, contact Jeanne Mullgrav at jeanne@capalino.com or (212) 616-5832.